Martin Margiela, fall 2001 collection. ses créateurs, Musée de la Mode et du Costume, Palais Galliera, Paris, 1991; Infra-Apparel, Metropolitan Museum of Art, 1993; Belgian Fashion: Antwerp Style, Fashion Institute of Technology, New York City; Martin Margiela: 9/4/1615, Rotterdam, 1997. Address: 13 Boulevard St Denis, 75002 Paris, France. Margiela et al, Martin Margiela: 9/4/1615, [exhibition catalogue],Rotterdam, 1997. Maison Martin Margiela Street, Special Edition, Volumes 1 & 2, Paris, 1999. Le monde selon ses créateurs [exhibition catalogue], Paris, 1991. Martin, Richard, and Harold Koda, Infra-Apparel [exhibition catalogue], New York, 1993. Borthwick, Mark, 2000-1: La maison Martin Margiela, Paris, 1998. Allen, Elizabeth, "Marvelous Martin," in WWD, 22 March 1989. Cunningham, Bill, "The Collections," in Details (New York), March 1989. Paz, Ricardo Martinez, "Los Margenes de Margiela," in Impar (Spain), No. 3, 1991. Voight, Rebecca, "Martin Margiela Champions the Seamy Side of French Fashion," in Blitz (London), March 1991. O'Shea, Stephen, "Recycling: An All-New Fabrication of Style," in Elle (London), April 1991. "La Mode Destroy," in Vogue (Paris), May 1992. Betts, Katherine, "La Nouvelle Vague," in Vogue, September 1992. Spindler, Amy M., "Coming Apart," in the New York Times, 25 July 1993. ——, "Four Designers in the Vanguard Hold the Line," in the New York Times, 11 October 1993. Zahm, Olivier, "Before and After Fashion," in ArtForum (NewYork), March 1995. Evans, Caroline, "The Golden Dustman," in Fashion Theory, Vol. 2,1998. Mead, Rebecaa, "The Crazy Professor: Why Was Paris Persuaded That the Radical Martin Margiela Was Right for the Venerable House of Hermés" in the New Yorker, 30 March 1998. Mower, Sarah, "Margiela Does Hermés," in Harper's Bazaar, June 1998. 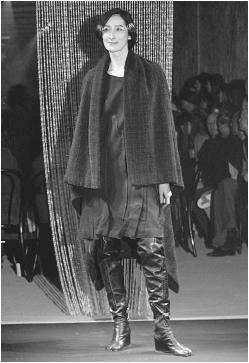 Braunstein, Chloe, "Martin Margiela, Couturier," in L'Architecture d'aujourd'hui, January 1999. Alexander, Hilary, "At Last: Margiela by Mail Order," in the Daily Telegraph (London), 19 July 1999. Murphy, Robert, "Margiela: Time to Step Up," in WWD, 15 February 2001. White, Jackie, "The Belgian Influence on Display: Designers Focus on Innovation and Design," in the Kansas City Star, 18 February 2001.
a professionalism: that makes one interested, curious, and inquisitive a positivity: that gives hope for the future. 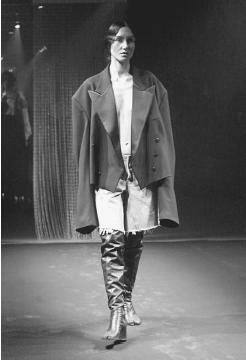 Martin Margiela is a powerful talent in avant-garde fashion. Formerly an assistant to Jean-Paul Gaultier, the Belgian-born Margiela showed his first collection in 1989 and immediately achieved cult status. He was heralded as fashion's latest bad boy genius and the most notorious exponent of la mode destroy. He dislikes the term "destroy fashion" and has insisted he does not regard it as destructive when he slashes old clothes. On the contrary, he told Elle in April 1991 that it is his way of "bringing them back to life in a different form." The idea of cutting up clothes goes back to the ripped t-shirts of the Punks and the subsequent street style of slicing jeans with razor blades. But the new deconstruction goes much further. Margiela has unravelled old army socks and made them into sweaters, transformed tulle ball gowns into jackets, recut secondhand black leather coats in the form of dresses, even made plastic laundry bags into clothes. He has designed jackets—beautifully tailored and lined with three different kinds of fabrics—with the sleeves ripped off. Although conservative members of the fashion industry cringed, young trendsetters enthusiastically embraced Margiela's radical look, which had nothing to do with traditional forms of ostentatious elegance and everything to do with creativity and what he calls "authenticity." Exposed linings and frayed threads testify to the internal construction of the garments, whereas the deliberate deconstruction of garments implicitly raises questions about our assumptions regarding fashion. Detached sleeves, for example, hark back to the way clothes were made in the Middle Ages, when mercenaries first slashed their silken garments. A cloven-toed boot-shoe and fingers laced in ribbons are rebellious statements in a world of high fashion orthodoxy. The freedom of Margiela's imagination also evokes the sartorial liberty of the 1970s (a decade Margiela views in a positive light), especially in contrast to the opulent and conservative 1980s. Like the hippies who pillaged flea markets, Margiela gave a second life to old and rejected garments, recycling them, and giving a priority to individual creativity rather than consumerism. Opposed to the status-hungry cult of the designer so ubiquitous in the 1980s, Margiela chose for his label a blank piece of white fabric, and resisted talking to the press about what his clothes "mean." Clothing per se interests him less than how styles are created and interpreted. In this respect, he is very much a conceptual and postmodern designer. Yet, like his former mentor Gaultier, Margiela is an excellent tailor who really knows how to sew, and his clothes, although undeniably strange, are beautifully (de)constructed. Margiela's aesthetic also extends to his fashion shows. He staged one show in an abandoned lot in a poor immigrant neighborhood of Paris, with local children dancing down the improvised catwalk along with the models. Another show was held at a Salvation Army hall, at the edge of the city, so that an international crew of fashion journalists found themselves wandering around, hopelessly lost, trying to read the hand-drawn map—and when they finally made it there, they had to perch on secondhand furniture and drink wine in plastic cups. Further, he held two simultaneous shows (one of all-black clothes, the other white) at the edge of a cemetery, with crowds of admirers fighting to get in. Symbolically powerful colors like black, white, and red have dominated Margiela's palette. In his atelier are posted dictionary definitions of these colors, with red, for example, being associated with wine, blood, and rubies. His atelier itself, on the Boulevard Saint Denis, is near the red-light district of Paris. Like his clothes, his studio is a masterpiece of bricolage. Graffiti decorates the walls, and the floors are covered with copies of old magazine and newspaper articles, which on close inspection turn out to be reviews of his collections. With Margiela steeped so deeply in the avant-garde sensibility, it came as a perplexing surprise in 1997 when he was appointed artistic director of womenswear for Hermés (which also happens to own a third of Gaultier's business), long associated with luxury and restraint. But the pairing has proved successful, with Margiela continuing the Hermés tradition of quality craftsmanship while playing with conventions of clothing construction and function. His collections for Hermés have been luxurious and subdued but still push the conceptual limits of structure. Dresses are soft and minimalist, sweaters are reversible, and coats double as capes. Margiela has also continued with his own label, and revenues in recent years have steadily increased, allowing La Maison Martin Margiela to expand. The label moved into mail order sales in 1999 and opened its first freestanding boutique in Tokyo in 2000, with further openings projected. Margiela himself is famously reclusive, communicating infrequently with the press and then only by fax. In keeping with his ideological convictions, he prefers not to become a public fashion personality, allowing the craftsmanship and design aesthetic of all his fashion collections to communicate his conceptual visions for him.